← US Presidential Election: Could Romney win the popular vote but lose the election? The analysis here is based on the latest figures available and final election figures have not been produced for most states as of yet. This post will be updated later in light of this factor. Despite a general trend for much of the month of October in which he was behind Mitt Romney in the national opinion polls (although still holding a sufficient lead in the swing or purple states to suggest he would have won the electoral college), Barack Obama has won the popular vote in the 2012 US Presidential Election with a narrow, yet decisive, margin of around 2.3% (suggesting a swing of around five percentage points from Obama to the Republicans since his more decisive win over John McCain in 2008). Obama, more importantly, has won the electoral college with an even wider margin of 332 electoral college votes (61.7% of the electoral college votes) to Romney’s 206 (31.3%), amounting to a 23.4% winning margin in the electoral college. Electoral geographers such as Charles Pattie (University of Sheffield) and Ron Johnstone (Bristol) have produced interesting work to explain why biases such the one favouring Obama in terms of his electoral college vote tally occur and their work is definitely worth checking out. The main factor here probablyrelates to the greater efficiency of the Obama campaign in terms of translating vote share into electoral college votes, or in terms of how the Obama vote was less likely to be wasted (in terms of relatively large votes in states where Obama lost narrowly and large surpluses in blue states which Obama won comfortably) than was the case with the Romney vote. 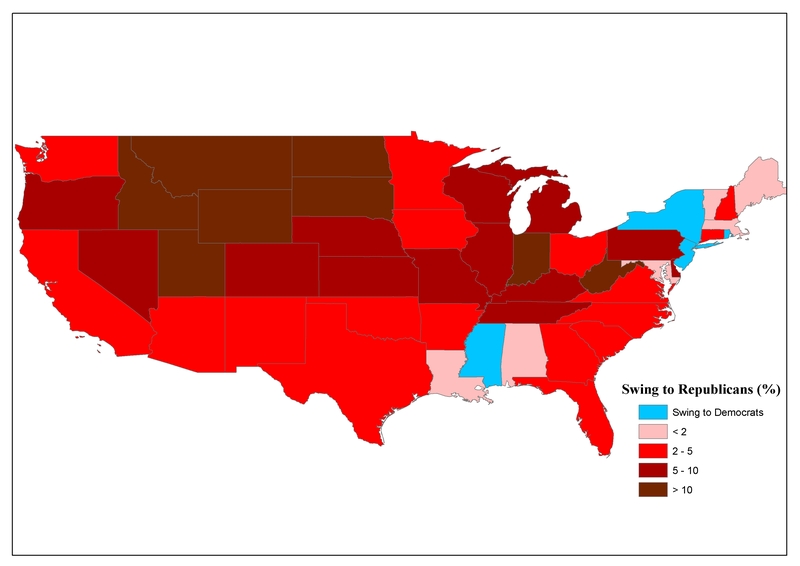 As the map below shows (Figure 1), Romney tended to win more states by very large margins than Obama did and hence more of the Romney vote was effectively wasted, either in terms of very large surpluses in his strong (red) states, such as Utah, Wyoming, Idaho and Oklahoma (in percentage terms) or Texas (in raw, or popular, vote terms). Votes won by Romney in the large purple states that he lost narrowly to Obama in, such as Florida, Ohio, Pennsylvania, Virginia and Colorago, would similarly be added to his widening tally of wasted votes. Figure 1 shows that American politics still remains highly polarised. Romney enjoyed a margin of victory of ten percent or more in twenty red states while Obama’s margin of victory was similarly greater than ten percent in fourteen blue states. Once the official votes have been finalised, Missouri could well be added to this strong red state grouping while Oregon could make up a fifteenth blue state in which the Obama margin of victory was seen to exceed ten percent. If Oregon and Missouri are excluded, this means that there were only thirteen states in which a candidate’s margin of victory was less than ten percent, while the margin of victory was less than five percent only in the five purple states of Florida, Ohio, North Carolina, Virginia and Colorado. 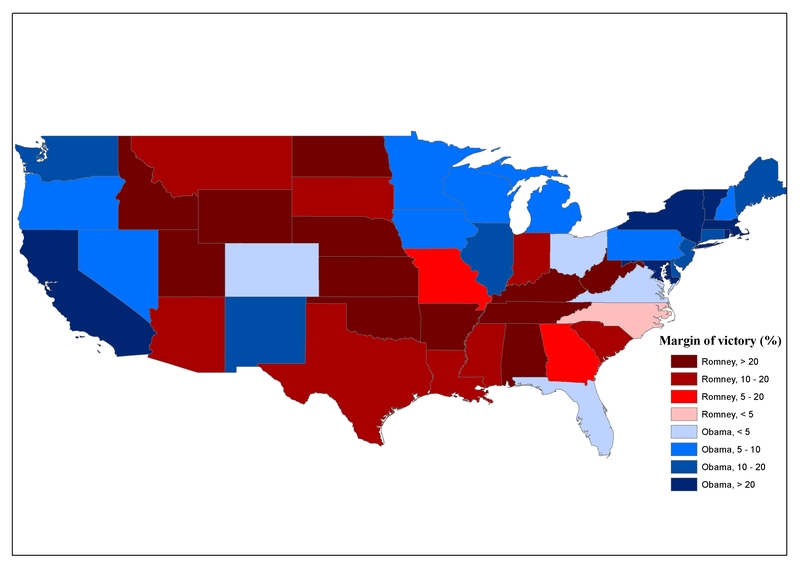 Figure 2: Swing (%) by state from Obama to the Republican candidate between the 2008 and 2012 US presidential elections. The map above (Figure 2) shows that the strongest swings to the Republicans tended to occur in their Mountains/Plains (including states such as Montana, North and South Dakota and Utah) and, to a lesser extent, South regional heartlands (a case of the red states getting “redder” and effectively in most cases amounting to a case of “wasted votes” given that these vote increases, with the exception of North Carolina and the 2nd Congressional District in Nebraska, did not result in state (and electoral college vote) gains from Obama by Romney. Admittedly there was also a notable swing to the Republicans in the hotly contested Mid West battleground region. What is interesting here is to note the areas where there was actually a swing to Obama, relative to the 2008 results, or where the level of swing was not as pronounnced as in the rest of the country. The one thing that stands out here is the fact that the areas tend to be areas worst hit by Hurricane Sandy in the North East region (including the states of New Jersey and New York) but also the Gulf of Mexico states (Louisiana and Mississippi) that were worst hit by Hurricane Katrina in 2005, even though these are also staunch red states and even though the Republicans had done relatively better in terms of holding their vote in these states in the presidential election following Katrina (the 2008 election) than in other parts of the USA. The swing to Obama from the Republicans (or relatively narrow swing to the Republicans) in the North East, contrasting with the trend in most other states where a swing from Obama to the Republicans of five percent or more was evident, could be related to a general sense of satisfaction amongst people in this region, and especially in the states of New Jersey and New York, in relation to Obama’s handling of crisis and also in terms of how this stressed the efficacy of the Democrat “big government” approach in crises such as this. The swing in support to Obama from the Republicans in New Jersey and New York are even more dramatic when the high base of support that Obama was starting from (his 2008 vote share in those states – 63% in New York and 57% in New Jersey) is taken into account. The praise given to Obama by New Jersey’s Republican governor, Chris Christie, no doubt was also a factor in that state. What is interesting is that the other region where the swing from Obama to the Republicans proved to be less pronounced was the Gulf of Mexico region, including the areas that were most adversely effected by Hurricane Katrina in 2005. While the hurricane did not seem to be a factor that signficantly infuenced the result of the presidential election immediately following Katrna (and indeed Louisiana was one of a small number of states in which the Republicans gained relative to the Democrats in the 2008 contest), the proximity of the Sandy event to the 2012 polling day may have offered voters there a reminder of their experiences with Katrina and the inadequate response of the Bush administration in that event compared with the stronger response of the Obama administration. Admittedly in none of these cases did these support swings translate into electoral college gains by Obama, as the blue states of the North East still remained blue states and the Gulf of Mexico states still remained red, but it is an interesting example of the impact of Hurricane Sandy on this electoral contest. The state with the biggest swing towards Obama (and not shown on the map) was Alaska, where a decline in the Republican share of the vote relative to that won in 2008 when Sarah Palin was vice presidential candidate effectively amounted to an 8% swing to Obama in that state. This entry was posted in Election boundaries, opinion polls, US elections. Bookmark the permalink. I was browsing through the county level results in the swing states into the wee small hours, and my general impression – not supported by definitive number-crunching – is that there was a big swing against Obama in smaller, more rural counties which was muted by stasis or swings to Obama in larger urban counties. In other words, a widening polarisation – Republican areas became more republican, democratic areas became more democratic. The sense I got was two main factors ensured Obama’s victory : A successful registration and GOTV drive in metropolitan areas (especially amongst blacks) and increasing Latino alienation from the GOP which cose them dearly.